A glioma is a type of tumor that starts in the glial cells of the brain or the spine. Gliomas comprise about 30 percent of all brain tumors and central nervous system tumors, and 80 percent of all malignant brain tumors. Oligodendrogliomas are a type of glioma that are believed to originate from the oligodendrocytes of the brain or from a glial precursor cell. They occur primarily in adults but are also found in children. The average age at diagnosis is 35 years. An ependymoma is a tumor that arises from the ependyma, a tissue of the central nervous system. Usually, in pediatric cases the location is intracranial, while in adults it is spinal. 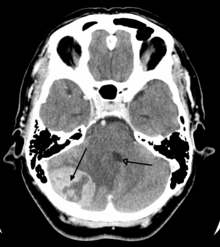 The common location of intracranial ependymomas is the fourth ventricle. Rarely, ependymomas can occur in the pelvic cavity. Meningioma, also known as meningeal tumor, is typically a slow-growing tumor that forms from the meninges, the membranous layers surrounding the brain and spinal cord. Symptoms depend on the location and occur as a result of the tumor pressing on nearby tissue. Many cases never produce symptoms. Occasionally seizures, dementia, trouble talking, vision problems, one sided weakness, or loss of bladder control may occur. 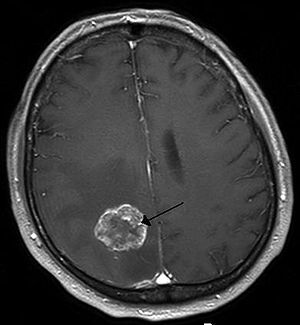 Glioblastoma, also known as glioblastoma multiforme (GBM), is the most aggressive cancer that begins within the brain. 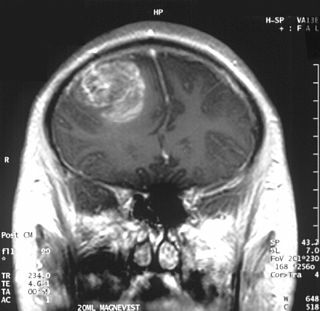 Initially, signs and symptoms of glioblastoma are non-specific. They may include headaches, personality changes, nausea, and symptoms similar to those of a stroke. Worsening of symptoms often is rapid. This may progress to unconsciousness. Diffuse zones of infiltration, that share various features, including the ability to arise at any location in the central nervous system, but with a preference for the cerebral hemispheres; they occur usually in adults, and have an intrinsic tendency to progress to more advanced grades. Chondrosarcoma is a cancer composed of cells derived from transformed cells that produce cartilage. Chondrosarcoma is a member of a category of tumors of bone and soft tissue known as sarcomas. About 30% of skeletal system cancers are chondrosarcomas. It is resistant to chemotherapy and radiotherapy. Unlike other primary bone cancers that mainly affect children and adolescents, chondrosarcoma can present at any age. It more often affects the axial skeleton than the appendicular skeleton. Oligoastrocytomas are a subset of brain tumors that present with an appearance of mixed glial cell origin, astrocytoma and oligodendroglioma. However, the term "Oligoastrocytoma" is now considered obsolete by the National Comprehensive Cancer Network stating "the term should no longer be used as such morphologically ambiguous tumors can be reliable resolved into astrocytomas and oligodendrogliomas with molecular testing." Pilocytic astrocytoma or juvenile pilocytic astrocytoma or cystic cerebellar astrocytoma is a brain tumor that occurs more often in children and young adults. They usually arise in the cerebellum, near the brainstem, in the hypothalamic region, or the optic chiasm, but they may occur in any area where astrocytes are present, including the cerebral hemispheres and the spinal cord. These tumors are usually slow growing and benign. 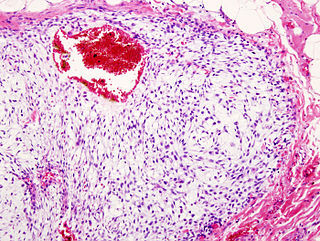 The neoplasms are associated with the formation of a single cyst(s), and can become very large. 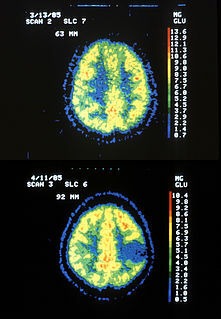 Ganglioglioma is a rare, slow-growing primary central nervous system (CNS) tumor which most frequently occurs in the temporal lobes of children and young adults. A primary central nervous system lymphoma (PCNSL), also known as microglioma and primary brain lymphoma, is a primary intracranial tumor appearing mostly in patients with severe immunodeficiency. PCNSLs represent around 20% of all cases of lymphomas in HIV infections. Primary CNS lymphoma is highly associated with Epstein-Barr virus (EBV) infection in immunodeficient patients, and does not have a predilection for any particular age group. Mean CD4+ count at time of diagnosis is ~50/uL. In immunocompromised patients, prognosis is usually poor. In immunocompetent patients, there is rarely an association with EBV infection or other DNA viruses. In the immunocompetent population, PCNSLs typically appear in older patients in their 50's and 60's. Importantly, the incidence of PCNSL in the immunocompetent population has been reported to have increased more than 10-fold from 2.5 cases to 30 cases per 10 million population. The cause for the increase in incidence of this disease in the immunocompetent population is unknown. 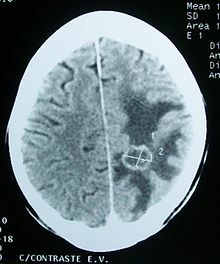 Fibrillary astrocytomas also called low-grade or diffuse astrocytomas, are a group of primary slow-growing brain tumors. They typically occur in adults between the ages of 20 and 50. Temozolomide is an oral chemotherapy drug. It is an alkylating agent used as a treatment of some brain cancers; as a second-line treatment for astrocytoma and a first-line treatment for glioblastoma multiforme. Astroblastoma is a rare glial tumor derived from the astroblast, a type of cell that closely resembles spongioblastoma and astrocytes. Astroblastoma cells are most likely found in the supratentorial region of the brain that houses the cerebrum, an area responsible for all voluntary movements in the body. It also occurs significantly in the frontal lobe, parietal lobe, and temporal lobe, areas where movement, language creation, memory perception, and environmental surroundings are expressed. These tumors can be present in major brain areas not associated with the main cerebral hemispheres, including the cerebellum, optic nerve, cauda equina, hypothalamus, and brain stem.